As competition heats up, innovation takes the hit. A close look at iPhone 6 and Note Edge, the best in the market, proves it. iPhone 6 Plus and Samsung Note Edge. Even before the latest series of smartphones hit the market, there was a growing debate on whether innovation, as a concept, has peaked. The latest launches - Apple's iPhone 6 and 6 Plus and Samsung's Galaxy Note Edge - seem to further this argument. Though the smartphone makers use the word more often, it has come to be seen as a glib sales pitch meant to make inroads into consumer imagination. Innovation was supposed to ride on cutting-edge R&D. But in the technology space, it is being fast replaced by a new war on specifications. Take for instance, the iPhone. It is seven years old. When it hit the market first in 2007, it was a piece of wonderment. Steve Jobs, the late co-founder of Apple, called it a 'revolutionary product' from the company that had earlier launched the iPod music player in 2001 and the Macintosh computer in 1984. Tim Cook, CEO of Apple, can hardly say that for iPhone 6 and 6 Plus. So he called them the 'biggest advancements in the history of iPhone'. And what's that? A bigger display, of course. iPhone 6 has a 4.7-inch display and 6 Plus is even bigger at 5.5 inches. As a natural progression, the chipset has gone one notch up to A8. The company also introduced Apple Pay, a new payment service. But haven't mobile payment services existed before too? Apple has just managed to integrate this concept into the iPhone by tying up with partners and making it secure using its fingerprint scanner. And since the screen size is getting bigger and bigger, Apple has created a special iOS gesture for one-handed operation. The company calls it by a fancy name - Reachability. In the run-up to the launch of these devices, speculation was rife about the handsets. Online sites even imagined a see-through phone. Though nothing of that sort materialised, it shows what the consumer expects from the revolutionary innovator that Apple is known to be. Maybe the rate of innovation is unable to keep up with demand for new products. For Apple, whose phone business accounts for more than half its revenues, it is undoubtedly becoming a high-stakes game. Maybe its stock of apps and cloud-based services will keep it in good stead. But when it comes to size, can anyone forget Samsung even though it was Dell that introduced the first phablet. While Dell Streak failed to make a headway, the Note series took Samsung's business to new heights. Now in the fourth year, Samsung now lays claim to innovation with its Note Edge. But notifications on the edge of a smartphone isn't new. The Acer Metal smartphone had a notification display at the top edge of the phone four years ago. The only difference is Samsung has beautifully kept it to the side edge. It looks good and provides quick access to frequently-used apps, alerts and device functions. It works with a swipe of a thumb even when the cover is closed. The rest is all about bigger display, processor and camera. While we still wait for some innovation, the battle among smartphone makers once powered by R&D has been reduced to clubbing the best of all into a single device. 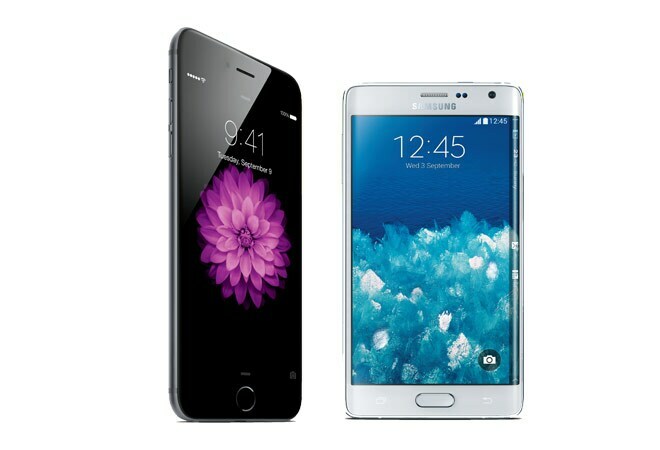 The latest entrants - Apple's iPhone 6 and 6 Plus and Samsung Note Edge - are the best examples.